I mentioned in yesterday’s post how much I loved The Lumber Room exhibition at York Art Gallery. The exhibition is curated by one of my favourite artists, Mark Hearld, who lives in York with another favourite artist of mine, Emily Sutton. The Lumber Room was inspired by a short story Mark read by Saki when he was a teenager (you can read the story here, and I highly encourage you to do so; it’s a quick, but delightful, read). Stepping into Mark Hearld’s exhibition is indeed like finding a wondrous room stuffed to the brim with intriguing and whimsical objects. The Lumber Room is filled with a wide range of artefacts: toys, ceramics, paintings, clothes and so much more, which perfectly capture the spirit of adventure and curiosity that permeate childhood. Everywhere you look something curious or beautiful catches your eye, encouraging you to stop and linger over every display. I took a childlike like pleasure in the vintage ice-cream stand, the old gloves and uniform jackets that made me want to play dress-up, and the wonderful lineup of rocking horses that were hard to resist stroking. Mark apparently spent two years researching the objects and artwork included in the exhibition, and I thought his curation impeccable, offering a superb mix of the beautiful and the bizarre. This would be a fantastic exhibition for parents or teachers to take children, as it would be a brilliant stimulus for art and writing projects. I’m a huge fan of Mark’s artwork, so I particularly enjoyed getting to see so many of his original paintings and ceramics as part of the exhibition, as well as many of the objects, colours, and styles that inspire his work. I’ve been to one of his and Emily’s studio tours in the past, which was also treasure trove of ceramics and paintings, and I remembered seeing some of his ceramic horses then too. Aren’t they exquisite? After spending quite a bit of time in The Lumber Room, we made our way round the rest of York Art Gallery. I was so impressed by the large, comfy sofas and big desks throughout its rooms that visitors are allowed to use (the gallery does a great job at being interactive, which makes it an enjoyable place for children too). As one entrance ticket allows you access to all exhibitions for the day, we also saw the current Albert Moore exhibition (on until October 2017). I thought it worth the cost of entrance fee just to see the glorious Midsummer painting. The incredible orange and green used in the picture can only be truly appreciated when seen in person, where the painting glows like a jewel amongst all the other works. 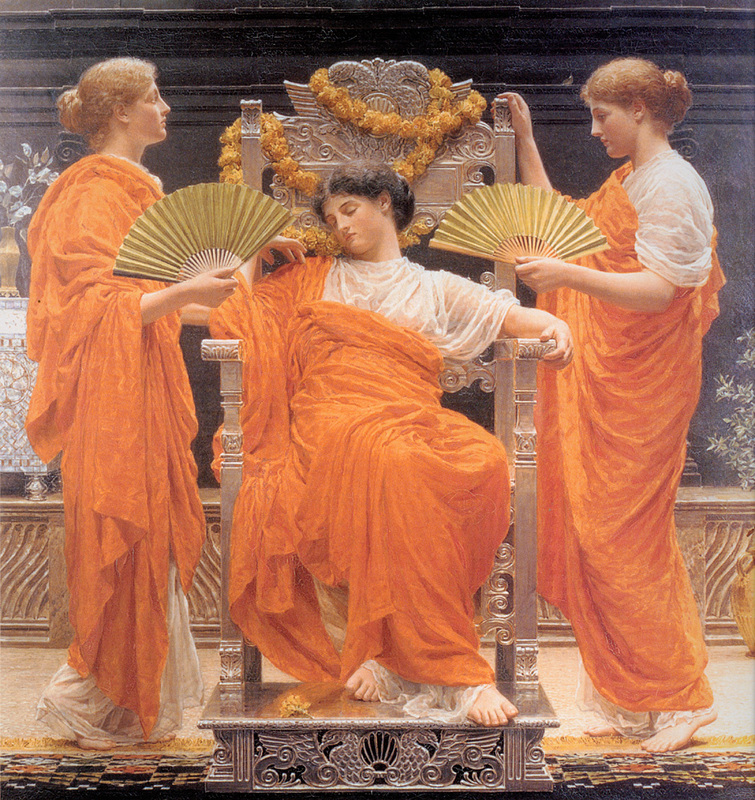 Midsummer, Albert Moore. Image via here. It’s definitely worth taking time to explore York Art Gallery properly. There is a viewing balcony, from which you can look out over the gardens and surrounding buildings. We didn’t have time to pop into the cafe, but it’s run by the same people behind No.8 Bistro, where we enjoyed a fabulous brunch, so I’m sure it would be very good should you fancy a bite to eat or cup of tea. The Lumber exhibition runs until 7th May, 2017; the Albert Moore exhibition is open until 1st October, 2017. At the time of writing, a standard adult entrance ticket to the Gallery is £6.81, and children under 16 go free with a paying adult. York Art Gallery is open everyday from 10am-5pm. Are you a fan of Mark Hearld’s artwork too? Have you ever been to York Art Gallery? P.S. – Look out for my York Travel Guide (Part 2), publishing in the next few days. You can read Part 1 here.